With this Pole Will Power has even set him self among the greats in Indy Car Series competition. see, he has tied the Great, AJ Foyt with 53 Pole positions in IndyCar. Not a bad place to be. It’s like it all fell together at Pocono. The Sun was in and out and kept the track surface temp at or near 110 degrees for most of the qualifying. Then heavy clouds rolled in like that have been in Pennsylvania for weeks now. 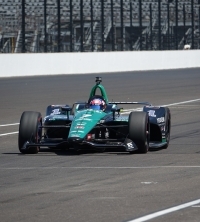 With a few fellow competitors waiting to hit the Tricky Triangle nothing was being written into the record books., With teammates waiting, and a few IndyCar heavy hitters sitting on deck no one counted this a win. Then one by one they dropped with points leader Scott Dixon waiting to make his run last. As Scott Dixon his the track does began to fall, everyone waited to see if the skies were going to open and allow more drenching of the Pennsylvania landscape. There was debate as to whether Dixon wanted to show his hand and known Power off the pole of would he just ride it out. The drops were coming in a faster pace now. The track temps had dropped by more than 5 degrees since Will Power last blistered the track. In the end, either Dixon decided to keep his cards close ti his chest, or he just did not have the Go Juice in the tank. 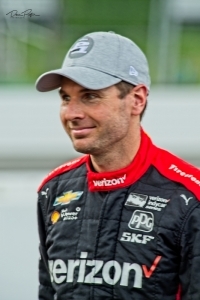 Will Power would take the Team Penske Chevrolet Verizon #12 to the Pole and hold. Not a bad showing for the Sponsor of the series and such a strong run for Power. 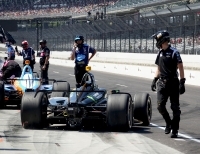 Josef Newgarden; #1, will start outside pole, with Alexander Rossi; #27, inside second lane, and outside of Newgarden will be Ryan Hunter-Reay; #28. Kicking it off in fifth tomorrow will be Simon Pagenaud; #22. That will round out the top five all who timed out within six tenths of a second of each other. Should Mother Nature smile down upon the event this should prove out to be one HOT IndyCar event at Pocono Raceway. I have been a Photojournalist for RIS-news for the past ten years more or less. I was a shooter for a Minority Publication here in Reading, PA. Unfortunately the publisher passed away ending the publication. Mike took me onboard the following February while covering Daytona freelance. I also shoot Football, Professional Boxing, and Pennsylvania Dirt Track Racing. Hailing from Reading, Pennsylvania what else would I do. In my real life I am also a sitting Magisterial District Judge... sports coverage is my escape!